Where’s the fire? Only the home was incinerated. Surrounding grass and trees are untouched. What kind of wildfire dustifies a building like that and doesn’t spread to the most highly combustible materials? 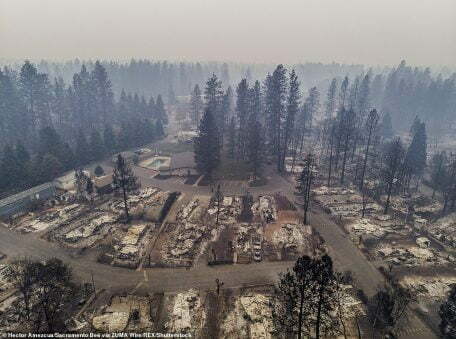 IS IT A COINCIDENCE THAT PARADISE CALIFORNIA WAS OBLITERATED? California is not the only place on our planet where exotic weaponry and other measures have been used to advance the agenda of the New World Order but it’s the most noticeable and active at the moment. We have extraordinary images, both still and video, of the carnage created by psychopathic, satanic murderers who believe they have the right to control and manipulate Humanity. Any sane, thinking person cannot look at the images we have as evidence and fail to realize it is due to intentional, planned, and high tech machinations. In the image above, we can see that the home burned from the inside out (like a microwave) and was reduced to white ash. A typical home fire leaves black timbers and soot and would have quickly spread to the surrounding grasslands and trees in “wildfire”-like fashion. The image below is more typical of the scene after a traditional fire. 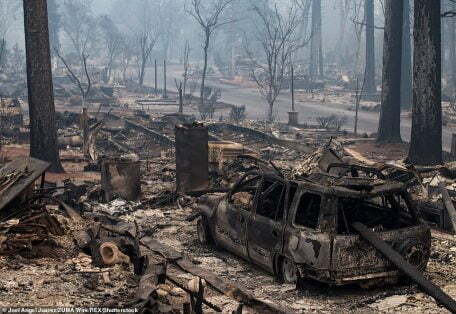 The trees are burned, the rubble is black. There are many facets to the agenda to clear Humans out of desirable areas in California, in particular, and pack them into tiny, concentrated urban areas where they will be under constant surveillance and easily controlled. I am not going to get into all the aspects of this plan again and how they have been engineering the gradual herding of the Human cattle (how “they” view us) because I have addressed this so many times before, but since the controllers have resumed their despicable agenda anew with even more horrific consequences, I wanted to provide the latest material available as evidence and add more fuel to the fire, if you’ll pardon the pun. I hope that if the information is out there in as many places as possible, the right people will find it and wake up to what is happening. Californians need to DO something about this problem. They need to band together and take authorities to task. We understand a group is suing PG&E, a Rothschild company. That’s a good start. Don’t miss this next video for an excellent update. 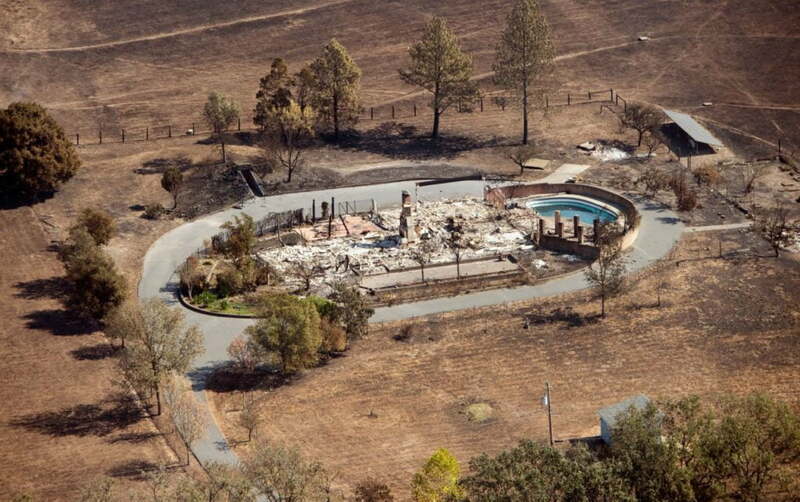 Isn’t it interesting that the Rothschilds are broke, selling properties, stocks and artwork, and now the corrupt Gerry Brown, puppet Governor of California, is getting federal funds after telling us these fires are the “new normal”? Deborah Tavares at Stop the Crime.net and Jamie Lee at A Plane Truthchannel to name two, have amassed more information than anyone would need to do this and Deborah has done Town Hall meetings in Santa Rosa, CA. Educate yourselves and don’t let the psychopaths’ minions intimidate you. They will use every trick in the book to manipulate their victims. Thanks to social media, blogs and citizen journalists on YouTube, there are now more people realizing that the fires are intentional and the destruction is not accidental or even arsonist in the usual sense of the word. They’re not started by BBQs or some lone nut, despite what the lamestream, lying, treasonous media tells the public. The psychopaths own nearly all the mass media outlets and they tell the talking heads what to say. It’s all scripted. I have shared this video below in the past but it screams sabotage and illustrates the points one needs to note to understand there is no other explanation other than the fact that California is under siege with exotic weapons. No rational person with any intelligence can watch this video and believe the lies told to shroud the agenda in fear and happenstance. There was no one here spraying water on homes to prevent fire from leaping from one to the next. Everyone was evacuated because they started the fires in specific places and whipped up the winds to gale force “Santa Ana” style and knew where the fires they started to camouflage this leveling of thousands of homes would take place. No one was there to see this unfold—until just recently in November 2018 when people trying to flee were killed in their vehicles trying to escape, as shared in video yesterday. A resident returned to find the skeletons of neighbours in their cars trying to escape. I am not going to surmise how those deaths occurred as it could have been multiple causes and even I am not ready to accept that the psychopaths used directed energy weapons on people rather than just property. Don’t take my word for it. Explore this website and consider the multi-pronged approach the shadow government’s “military industrial complex” uses to eliminate most of the Humans on this planet and scrape the remnants into pathetic little piles in areas where they deem it convenient for us to reside, while slaving our lives away to make them wealthy. They consider themselves “elite”. They are not—in any sense of the word. In fact, they are less than Human. I call them sub-Human. In fact they are only partially Human; hybrids. They are a scourge that needs to be eradicated from our planet. That is The Plan, as outlined by QAnon, and it has been in the works for many years. For eons. Finally, someone or a group of someones realized that if the planet and her people were to be saved from certain catastrophic destruction by these sadistic creatures, the plan to stop it had to be implemented—and immediately. They wanted to remain in the shadows and selected Donald Trump as the intermediary with the public. He rose to the challenge and has performed admirably but he cannot eradicate thousands of cabal ‘soldiers’ on his own. They infiltrate every department of the government and its agencies. Mercenaries do their thug work. The President needs the full support of The People and they need to mobilize and take action. Man cannot easily fight an invisible enemy, so those of us who became aware of our plight have been doing our best to warn and educate others. Many refuse to see the truth. We have all been programmed to accept certain tenets of life that are the opposite of the reality and unfortunately, some people can’t see that they have been deceived, or can’t face it. It’s time to put our pride aside and realize we’ve all been deceived, tricked, and manipulated into doing what the jailors on the planet wanted us to do. No more. It ends here. We no longer have the luxury of sleeping through the nightmare to wake up and find it was all a bad dream. The threat is real, and it is our responsibility to do whatever we can to be our own saviours. There are several good articles at this website about the topic. Californians must understand they are under attack and take action to stop it. Does the forced exodus from the Golden State involve a giant rail project? Is this part of the, “You’re going to get rid of your cars” initiative? Or is it about the gold? There are always red herrings tossed out in the alt media to divert from the truth. Or perhaps they’re all true. They tried to evict the Bundys in Nevada for the uranium, and we understand most of America was sold off to China and other countries right out from under the American people. There are many factors in play here and it will take time to get to the whole truth. Be sure to see the comprehensive coverage of the current fire situation at Galactic Connection. It’s lengthy with plenty of photographs—some from the Sheriff’s Department, and maps. This is happening everywhere people! The USA is not alone. We’re seeing it here in Australia too. You’re so lucky you have Trump. We have treasonous govts who are still selling us out. But there’s so many here now who are awake to whats happening. Western Countries are ALL targeted, not just the USA. I am grateful for the lessening body count, however, think about it, why would these seniors evacuate when they looked to their left and right and saw no fires immediately threatening their homes ?? These are seasoned mountain folk, I know, I used to be one of them. No wonder they were incinerated in their homes, the attack came from around them, but also from above. If there are no bodies in these houses and all is dustified, then that should bring back memories of 9/11. Agreed, Trump needs to declare ML and start the arrests, it sickens me how the media is lying, how people are not awake to what is happening. The denial is amazing, nobody hardly talks about it on FB. We must awaken and see reality, we are prisoners all of us and it’s time we reclaims our sovereignty from these satanic entities who for 350k yrs have controlled earth. Galactics are here but we need to see them, we need tangible proof and the world needs proof that all has been an illusion and change is coming now! This is MJ. Sorry for the stupid spellcheck errors! I always review what I write, but as you all might know, thats the $700. iPhone spell check for ya. Helicopter for Helleecootwe – lol. But I’d like to say it has rained nonstop since Thanksgiving. Thats the biggest Thanksgiving ever!! It has not rained for 7 months, and guess who caused that? NOT nature!! And do you know what? Some of Those wonderful firemen still worked on Thanksgiving, looking for the 1000+ missing bodies. God bless them ALL! I’m in a small mountain town 2 hours away from Paradise. PGE calls us got a few days before Paradise fire, then helicopters flying over the house here, same day as Paradise – so close above and noisy in the sky, and we I could even see the pilot. We called the Sherrif wondering if they were looking for a criminal or something in our wooded home and Sherrif said it was PGE checking poles. Ok, I get it now! It’s a way for a cover story. Now we are scared. (original?Northen CA people call them Piggy because that acronym spells that out) said power may shut off as it’s ‘too hot and windy’ so power had to shut off… BUT not a single breeze or tree leaf blowing and only 73 degrees. Which it should be 40 and raining in this season. Then the Paradise got BBQd the next day!!! I’ve been crying for the people there everyday. My nephew evacuated safely. I wonder if ‘they’ got it mixed up – Paradise and my town both start with P’s. Hmmmm. Are we next? Anyone in the Sierra Nevada Mountain foothills, please call me. WE need to stop this ASAP! Pres Trump was in Paradise today. He knows so I pray he and his military are figuring out a strategy – like all else happening. The sooner the Trump admin. starts revealing the full scale corruption and the action being taken to correct it the sooner the world can further awaken. Until that happens I think many people will not grasp the full extent of what is happening. I’m guessing that the stalling is due to making sure all will go as legally planned but this stuff from the Dark Ones is outrageous. It is imperative that all stay out of fear and pray to the Creator for the wisdom to know how to serve. Let’s pray for Gaia and ourselves.